In the winter Randal and I bring out the puzzles. Jigsaw puzzles to be exact. The one end of our dining room table becomes a puzzle board for months. We did this even when our son was growing up, although we did puzzles a lot more then since we were homeschoolers. There's great value in puzzles for brain training. It seemed I made many activities into educational events. We found that doing puzzles is a great relaxed way to bring family together to chat about topics without being "in your face" about them. We began in December with one of our Christmas puzzles. This nativity scene is one I received from my son years ago. Since we don't do much in the way of Christmas decorating, as we've simplified the holiday, it's great to focus on the details of the Christmas puzzles which are all centered on the Real Reason For The Season ... Jesus Christ. Jigsaw puzzles are excellent brain training and co-ordination improvement tools and are quite fun! In particular, they develop your abilities to reason, analyze, sequence, deduce, logical thought processes and problem solving skills. We generally like the 1000 piece ones, but any size works. We didn't begin with puzzles that large. This hummingbird puzzle has a lot of colors in it and although not very big is still challenging since the shades of colors are very similar. It's also a challenge to be able to "see" all the butterflies and hummingbirds in the puzzle after you have it together. The colors almost hide them. When you are able to use both the sides of the brain, you will find that your mind power is harnessed to its best and gets better. Jigsaw puzzle helps you exercise both the parts of your brain. Left-brain thinks logically and follows sequence while the right brain is creative, intuitive and emotional. When you put together a jigsaw puzzle, you harness both the brainpowers. While working on jigsaw puzzles, it has been studied that there exists continuous activity involving all the cells and parts of the brain ... There have been several studies like the MacArthur Study, that has found that people who have been used to doing jigsaw puzzles as well as cross word and were fully active stood to gain a longer life span and also lesser chances of falling prey to Alzheimer’s, memory loss, dementia and other old age problems. We take turns choosing puzzles and one of Randal's favorites is Great Events of the Bible. It's amazing the amount of "stories" that are shown on this puzzle. The border is always real easy to get together since it's the books of the Bible, so easy to find the end pieces and easy to know where they fit in if you know the order of the books. Sometime during the year, we purchased a new puzzle. 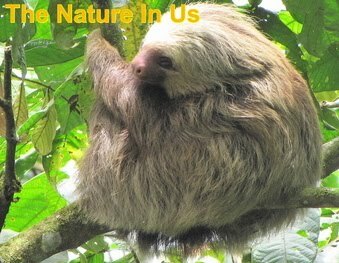 We love doing the same ones over and over for many years, but any time we see one that will also be educational and having to do with God's Creation, we can't resist. 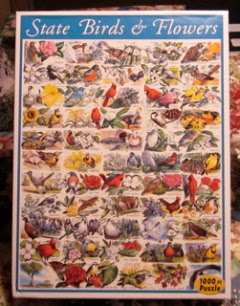 So, we purchased one that showed the state birds and flowers. We're working on that one now. It's very interesting and presents many questions for our minds. Like, why would Oklahoma (Randal's home state) choose mistletoe, a parasitic plant, as their state flower? Did you know that the Cardinal is the bird chosen for the most amount of states - seven (7)? The Mockingbird is not far behind at five (5). Two states, Rhode Island and Delaware, have both chosen a chicken. There's so much to learn and my favorite subject is anything that God has created. The wonders of His glory in all His artistry amazes me and is beyond my brain's capacity of what AWESOME really means.